The fibula is the long bone of the lower leg on the outside of the calf area. The fibula bone is a thin bone, so it is vulnerable to fracture if it is struck along the side of it, such as in a motor vehicle accident or if the ankle is twisted. Fractures can occur on the upper part of the fibula, near the knee, on the shaft of the fibula (especially from direct hits to the leg), and near the ankle, where they are often associated with other ankle injuries. Fibula fractures can occur alone such as when the ankle twists inwards. They can also occur along with a fracture of the nearby tibia, especially in falls from great heights or from a motor vehicle or motorcycle accident. Fibula fractures may be considered “complete,” meaning that the fracture goes all the way through the fibula bone, or “incomplete,” meaning that it goes through just part of the bone, bending but not completely breaking or dislodging the head of the fibula from its proper position. Because the fibula bone only supports about 17 percent of a person’s body weight, it is not as severe as a tibial fracture. Those who play contact sports like hockey, lacrosse, soccer, or football. Those who play sports that cause twisting of the ankle such as basketball and skiing. People with thin bones from tumors or from osteoporosis. People who have metabolic disorders resulting in mineral deficiency, such as bulimia and anorexia. People who have not been using their legs much and have poor flexibility and muscle strength. In the beginning, just after the fracture has occurred, it is a good idea to practice the RICE principles, which stands for Rest to the affected leg, Ice to the fractured site, Compression of the affected area, and Elevation of the leg above the level of the heart. Because the fibula is not a weight-bearing bone and is rarely displaced, the bone almost always heals within six weeks. Most people can have a cast or crutches to rest the leg and allow it to heal. 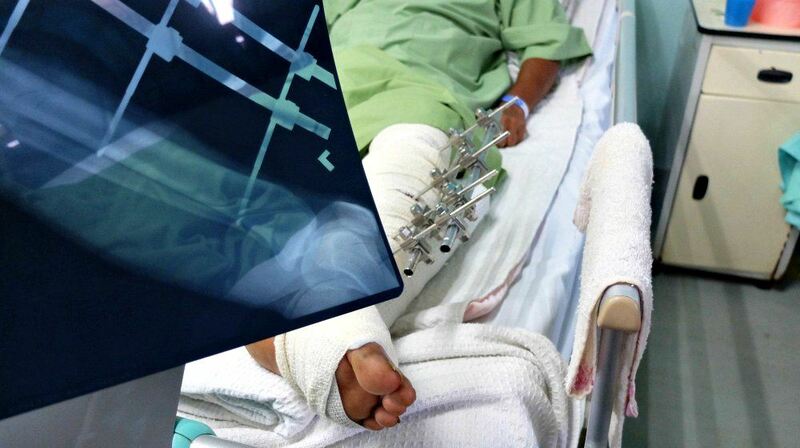 In some cases, if the bone is displaced or the tibia and fibula bones are fractured as well, the injury may require surgery that will place a rod down the center of the bone or plates and screws to hold the bone together is used. After the bone has healed, physical therapy is performed to help strengthen the leg and improve its range of motion and flexibility. Strong pain medications may need to be used in the beginning stages of healing, but most people eventually do well with NSAID (nonsteroidal anti-inflammatory medication) therapy or acetaminophen. It is rare to have a complication of a fibular fracture; however, complications can occur. These include failure of the bone to connect back together (a condition called “nonunion”), failure of the bone to heal in its proper position (“malunion”), compartment syndrome because of swelling of the leg that interferes with circulation and sensation to the lower leg, and infection, if the fracture is open to the outside so that organisms can get inside the bony fragments. The bone can heal shorter than it is supposed to and can cause a leg length discrepancy in children. There can be surgical risks, such as infection, numbness, weakness, and paralysis of distal nerves. If the patient resumes normal activity too soon, before the leg has healed, it may take longer to heal. 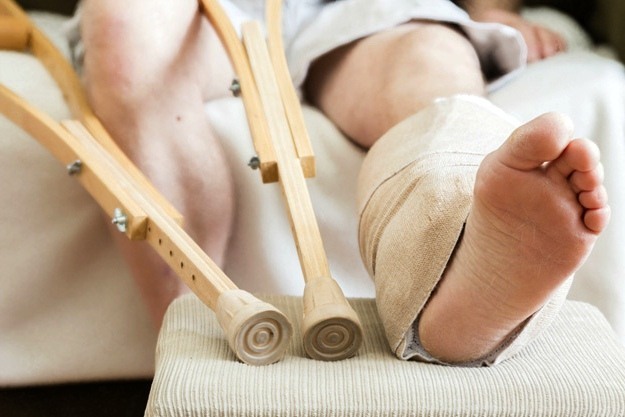 When a fibula fracture is due to a car accident, motorcycle accident, or fall, there is little that can be done in the way of prevention. For sports-related fibular fractures, prevention involves warming up and stretching before the sporting activity, increasing the strength and flexibility of the joints around the lower leg and maintaining good cardiovascular fitness. There is protective equipment that can be used in certain sports to minimize injury to the lower leg. See the doctor if treatment has started and there is increased swelling above or below the cast or restraint, if the pain is severe and unrelenting, if the skin is blue, white, or gray below the site of the fracture, or if there is numbness or tingling below the fracture site. I'm Ed Smith, a Sacramento personal injury attorney who has been helping clients with severe fractures resulting from accidents caused by other's negligence. I've been representing people across Northern California in their claims since 1982. If you have been injured in an accident, give me a call today for free and friendly legal advice. You can reach me at 916.921.6400 or (800) 404-5400. If you have been injured in an accident, please call me for free and friendly advice at 916-921-6400 or 800-404-5400.